You would think having such an affinity for Basket Case that I would have seen the sequels a million times. Well, you would be wrong because before last weekend I hadn't seen them at all. I figured now was a perfect time to watch them, after just watching the original and it being October. 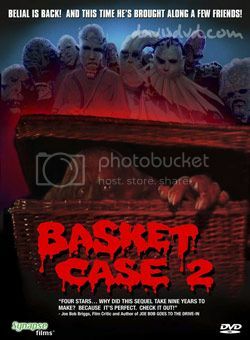 Basket Case 2 begins with Duane and Belial taken in by their Aunt, Granny Ruth (why isn't she Auntie Ruth?) to recover from the injuries they sustained at the end of the first film. Ruth used to be known as Dr. Freak because she would open up her home to those with physical deformities to get away from circus sideshows and an unaccepting public. Though supposedly retired, Ruth has a secret clan of misfits hidden in her house and she does her best to make Duane and Belial feel at home. Duane is still striving for a normal life though and wants to leave but after they are hounded by news reporters, he decides that he wants nothing more than to be with his brother. Basket Case 2, made 8 years after the first, is not as dark or gross as the original. The makeup FX for the freaks in the film (and Belial) are way more professional than the first film (courtesy of the great Gabe Bartolos), as is the acting. The story is just as over the top and crazy as you would expect and it was very clever to add in a whole new group of deformed characters. This is a fun sequel and it's great to see Kevin van Hentenryck back as Duane. I wouldn't call it the classic that the original was but it's a solid follow up that thankfully doesn't just try to repeat the first film.